This breakfast dish ... a sort of "spring green benedict", is a good way to enjoy a little asparagus this weekend. I enjoy making up eggs-benedict-type dishes; pretty much anything with a stack of stuff topped by a poached egg kinda works, and some flavor combinations work really well. I think this one does. The cheese I actually used was a mold-ripened goat/cow cheese blend which we got from some cheesery or another at Goatapalooza at the Ferry Building. It was delightful in this, but a decent brie, camabert, tallegio or similar "gooey, tangy" cheese will work as well. Trim the asparagus down to 4" to 5". Put a pan of water on to simmer for the asparagus and eggs. Toast the crumpets, and spread them with the cheese while still warm. Poach the asparagus in the simmering water using a larger strainer or vegetable steamer, for 2 to 5 minutes depending on how thick it is. You want it to be still firm, but cooked and easily cut. Drain and dry. Poach the eggs. 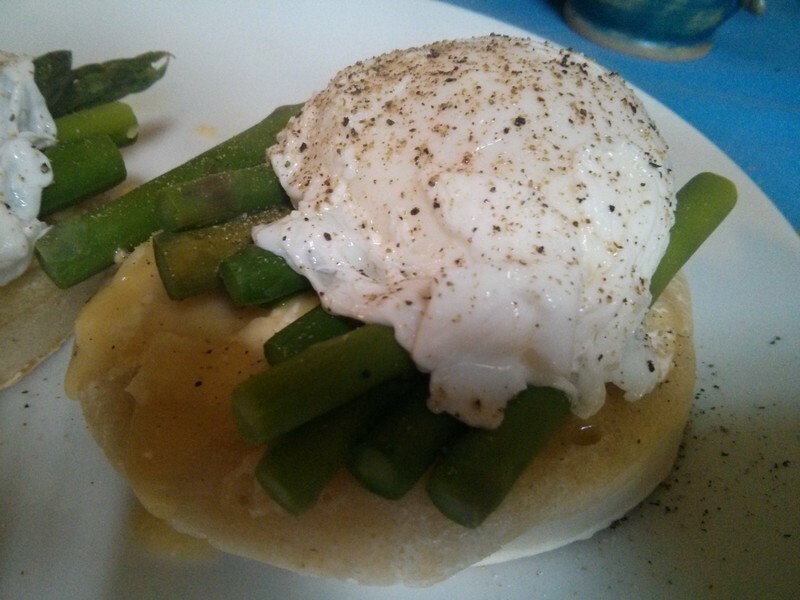 While the eggs are poaching, arrange the asparagus on top of the crumpets. Top with the poached eggs, salt and pepper.